Ansar Bayt al-Maqdis says bus that exploded in Taba was "headed toward the Zionists", promises to continue its war against Egypt. Ansar Bayt al-Maqdis, the Al-Qaeda linked terror group behind the terror attack on a bus carrying Korean tourists in Taba, threatened on Monday that it would carry out more attacks. According to Reuters, the group confirmed that the bus bombing was a suicide attack carried out by one of its men. 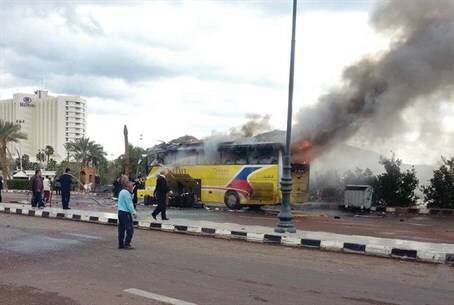 "Ansar Bayt al-Maqdis has successfully sacrificed one of its heroes to detonate the bus headed toward the Zionists, and this comes as part of our economic war against this regime of traitors," the group said in a statement quoted by the news agency. "With God's will we will be watching this treacherous gang of infiltrators and we will target their economic interests in all places in order to paralyze their hands from (hurting) Muslims," the Ansar Bayt al-Maqdis statement said. On Sunday, several hours after the attack, the group promised on Twitter that it “will continue to hurt the leaders in Egypt, the economy, the tourism and the gas." The Brotherhood has denied any link to terrorism. On Monday, it condemned the Taba attack and termed it “cowardly”. “The Muslim Brotherhood strongly condemns in the strongest possible terms the cowardly attack on a tourist bus in the town of Taba. We extend our most heartfelt condolences to the families of the victims and all those who have been affected by this terrorist attack,” the group said in a statement on its official English language website. “Muslim Brotherhood deplores all forms of violence and demand that the perpetrators of this heinous crime are brought to justice,” the statement added.